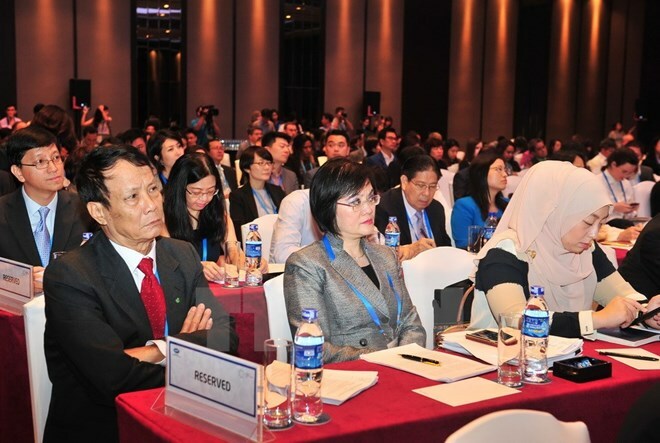 HCM City (VNA) – Growth cannot be sustainable unless it is economically, financially and socially inclusive, APEC officials said at a symposium in Ho Chi Minh City on August 28. In his opening remarks at the “Symposium on Promoting Economic, Financial and Social Inclusion in APEC”, Permanent Deputy Minister of Foreign Affairs of Vietnam Bui Thanh Son, who is also APEC 2017 SOM Chair, said that economic inclusion provides access to economic opportunity for all members of society to meaningfully participate in the economic life of their economy as employers, entrepreneurs, consumers and citizens. Financial inclusion provides access to useful and affordable financial products and services that meet their needs, such as transactions, payments, savings, credit and insurance, which are delivered in a responsible and sustainable way, he said. Meanwhile, social inclusion is the process of improving the terms for individuals and groups to take part in society. Social inclusion aims to empower all members of society to take advantage of burgeoning global opportunities and enhance equity, he added. According to the Deputy Minister, equal attention should be paid to three dimensions of economic, financial and social inclusion. Effectiveness of each dimension would be reduced if the other two are not keeping pace. Conversely, enhanced effectiveness of one dimension will feed into the other two. It is therefore imperative for APEC to take a strategic and holistic approach to inclusion. While APEC has made lots of efforts to promote inclusion, there remain significant gaps between what APEC has done and the expectations of the people, he said. To strengthen APEC’s role as a driving force of global growth, all segments of society will need to be brought on board, he stressed. Inclusion is really at the heart of all economies, developed and developing, he said, adding that Vietnam is no exception. Son further explained that more than 30 years of "Doi moi" (reform), the country has brought about significant socio-economic progress. Yet Vietnam is still grappling with increasing income inequality. Therefore, Vietnam is resolved to build a facilitating and action-oriented government that works for the people and businesses. Addressing the event, Kamal Malhotra, Resident Coordinator of the UN in Vietnam, said that while many APEC member economies have well earned reputation for economic transformation and completed substantial progress in poverty reduction and economic growth, the challenges ahead in sustaining the progress are significant and should not be underestimated. He affirmed that the UN in Vietnam and in other APEC economies stand ready to provide technical, operational and pragmatic support needed by the governments to identify and implement feasible and innovative solutions to challenges to economic, financial and social inclusion. Ousmane Dione, the World Bank (WB)’s Country Director for Vietnam, also said the WB is committed to supporting countries and regions, including APEC, in this regard. In an interview granted to the Vietnam News Agency (VNA), Alan Bollard, Executive Director of the APEC Secretariat, said that the symposium is very important for APEC and for APEC Vietnam Year as well because it is in the middle of the priorities that Vietnam wants to achieve for delivery in Da Nang city in November. “The discussion in the room today is about how to make sure that people in the society are actually getting inclusive benefits from economic growth, not just some people but all people,” he said. Valery E.Sorokin, Ambassador-at-Large, Senior Official of Russia for APEC, said promoting economic, financial and social inclusion is a major initiative of Vietnam, and Russia most strongly supports this because the country also has some projects and initiatives in the same topic. “One of the initiatives of Russia is about how to develop economic growth and integration in APEC economies. You know Russia is very big, we have a lot of regions, we have many remote areas which need development and we think that practically all other APEC economies have the same problem. That is why our initiative got universal support,” he said.